A mild Thai curry that comes from South Thailand and carries a strong Muslim/Indian influence. In fact the name is a derivation of Mussulman which means Moslem person. This curry is very reminiscent of Indian and Malay Kormas, thick and creamy with just a hint of heat. 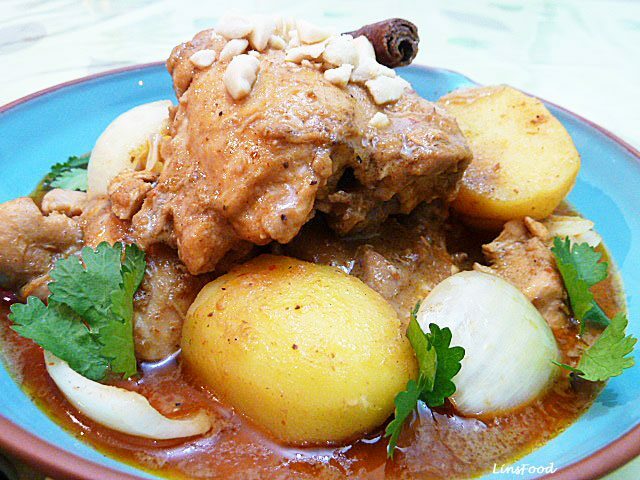 Massaman curry is very simple as long as you’ve got the paste. A good paste is essential, good shop bought ones are around if you look for them. For those of you in the UK, Waitrose stock a line called Thai Taste that’s pretty good. All the pastes are made in Thailand. Click here for homemade, if you’d like to try your hand at making it. In Thailand, this curry is often made with beef or lamb, and is quite often called “training curry” as its mildness makes it the perfect way to introduce children to spice without the heat. You can use any meat you like, it’s a matter of personal preference, I make a vegetarian version and it’s gorgeous! Think aubergines, courgettes, capsicum, beans and potatoes. A quick word about the meat used. On the bone is always best as the bones create a depth of flavour that will be missed otherwise. Do not use stock, you will alter the nature of the curry. If using chicken, I like to mix it up by using thighs and breasts or legs and breasts. Even better would be to use a whole chopped chicken (easily done by your butcher). Chicken will only take about an hour while beef and lamb can take 2-3 hours depending on the part used. Use cuts that you would use for a stew. When cooking with coconut milk, NEVER cover the saucepan and always simmer once it’s come to the boil. This is to stop the milk from curdling, even with the added stabilizers, that can happen. Vegetarian option at the end. Skim the top creamy part of the coconut milk (from one if using more) and heat this in a medium sized saucepan on high heat. Fry the paste, cinnamon, star anise and cardamom for a few minutes until the oil from the coconut milk separates. You will see a clear liquid at the edges of the paste. Add meat and stir to coat. Add the rest of the coconut milk and just bring it to boil. Lower the heat and simmer uncovered until the meat is cooked, about 30-45 minutes for chicken, depending on cut, 2-3 hours for beef or lamb. About 20 minutes before the end of cooking time, add the potatoes, onions, the tamarind paste and fish sauce. When the potatoes are done, stir in the palm sugar and lime juice and check the seasoning. Add more fish sauce and palm sugar if needed. Turn heat off. Sprinkle the peanuts all over and serve with plain white rice and a salad or a side vegetable dish. Converting a meat curry to a vegetarian one is pretty simple really. All you need to do is substitute the meat with the same amount of vegetables. I've made both a vegetable as well as a fish massaman curry with excellent results. What you need to decide is what vegetables to use. The potatoes will obviously stay. A perfect combination would be courgettes and aubergines. You could also use carrots, jackfruit, banana blossoms, okra or beans. Don't forget tofu if you like the stuff - I love it! Well, another triumph Lin. What you may lack in proofreading skills, you more than make up for with your recipes! This, again, was lovely. I used Quorn ‘chicken’ pieces, okra, courgette, mushroom and onion – realised at the last minute that I had ran out of potatoes, no matter it was delicious anyway. Onions get a mention twice in steps 5 & 6 – so a little confused which step they go in – I presume step 5. Is it palm sugar in step 6? Thanks, keep up then good work!